Social Forum Journey » 12 December Initiative – huge success or background for branding? Success or failure? see below. A great success with 100 000 demonstrators in the biggest and most varied mass rally ever for the environment and the climate? Or a demonstration were system critical popular movements may be allowed to play a subordinate role as providers of cannon fodder for police attacks and raising the number of participants for carrying forward a message supporting the system? Very few questions the image of success. The number of participants exceeds any other demonstration on climate change as well as any other demonstration at environmental summits. There has been occasions with higher number of demonstrators on environmental issues as when 200 000 demonstrated hand in hand along the sea shore to protect the Baltic sea in Estonia, Latvia and Lithuania in the late 1980s or 500 000 or a million demonstrated at the EU Summit in Barcelona 2002 were the question of water regulation and privatization was a main protest issue. There was also in total 200 000 demonstrating on climate change in different parts of Australia in 2007 but not in one place. 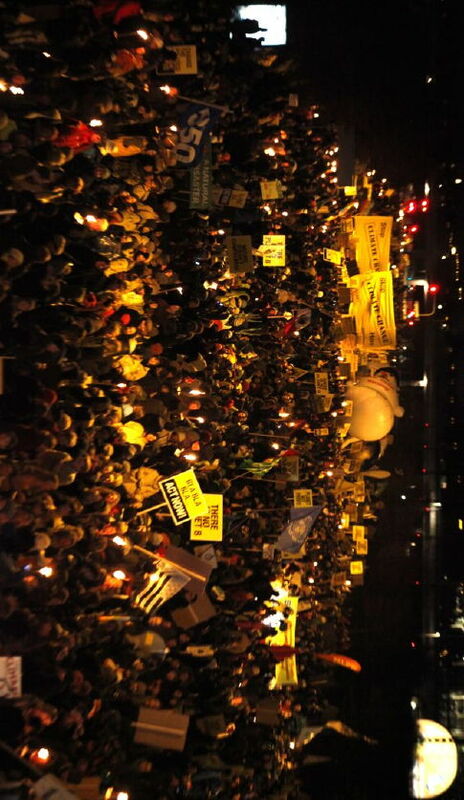 From London there are reports of 100 000 in a climate change demonstration December 5 in 2009 but other sources than the organisers claim far less. In Copenhagen there were early reports on December 12 from the police and elsewhere stating 25 000 or 40 000. But they changed, more people came into the demonstration during the way and the police finally also reported 100 000 demonstrators. It certainly were far more than anticipated with participants filling a whole broad main street for 2,2 km. At earlier environmental summits the demonstration figures have been considerably lower, 7 000 at the radical demonstration at the UN Summit in Stockholm 1972, 10 000 at the NGO and left wing party demonstration at the UN Summit in Rio de Janeiro 1992 and 5 000 at the more radical demonstration with favelaorganizations and their allies. 30 000 at the radical demonstration at the UN Summit in Johannesburg 2002 and far less at COP summits before Copenhagen if there was a demonstration at all. 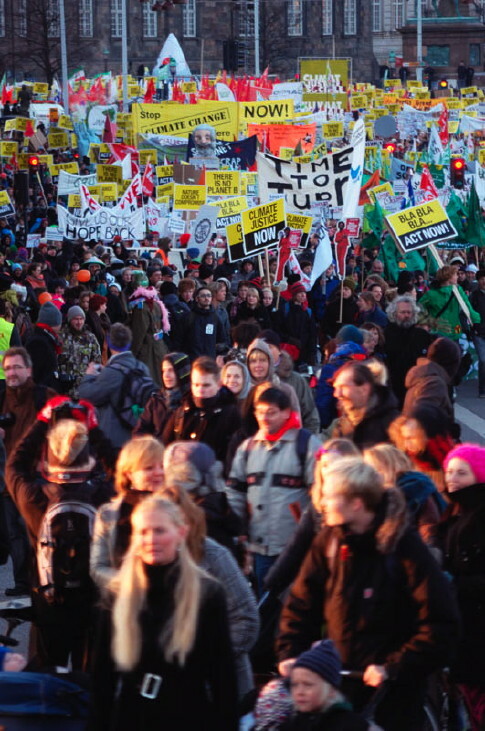 In terms of numbers the December 12 demonstration at COP15 therefore was a success. Among the organisers there had been very early in the process talked about 100 000. But later this was reduced by all to ambitions of 40 000 and hopefully 60 000. Taking the small size of Denmark and its capital with 1 ½ million inhabitants and the cold winter into account it was a great achievement. The diversity of the demonstration has also been put forward as a great success by many. In total there were at least 41different blocks ranging from NGOs like Action Aid to Libertarian Socialists. The demonstration was supported by 538 organizations world-wide. ”The march was long, loud, cold, bouncy, and energetic, about half Danes and half foreigners. I moved up and down the line, and everywhere people were chanting. This time the slogans were about climate, not some other issue, and they sounded and felt organic, rising up from the movement. People were happy. No one had expected 100,000. For the activists gathered from around the world, this was the largest climate demonstration they had ever seen, by far. Yet many activists find that the demonstration lacked in promoting a strengthening and unifying message.